Overlooking Eureka Valley, with views of the East Bay and beyond, this restored 1920s abode owned by art collectors is colorful and clever– asking $1.850 million. In its current configuration, this Corona Heights home has three bedrooms and two bathroms. There is also a profusion of color. For those of us who’ve grown weary of the white-on-white staging hues so common to local real estate, the personality of this home’s interiors offers a refreshing change. The kitchen glows, an effect of the combination of a skylight plus warm wood, bold tile choices, and stainless appliances. Listing agent Wendy Storch told SFGATE that the current owners are art collectors, and the glass boxes atop the custom cabinets display a collection of California Pottery. This home was built in 1924. Many of the original details shine here, especially in the facade, hardwoods, and original fireplace. But updates are also worth noting: that facade was actually restored by the current sellers, who are only the third to own this property since its creation. The refinished woodwork inside is also the result of the sellers’ attentions. As for modern changes, a converted lower floor now serves as a bedroom suite, with bed, sitting area, and French doors opening onto the back deck and gardens. A new owner could keep the current layout or convert this space again, making it a rec room, art studio, mini-theater, or guest room (maybe even an in-law apartment?). To top it all off, 4422 17th Street has a two-car garage. This property includes a 2,186-square-foot lot landscaped to enhance the secret garden feel of the lower level. A grassy area joins fruit trees and flowers, and an outdoor sitting area completes the scene. The home is set almost at the top of one of Corona Height’s many gentle slopes. From this vantage, there are expansive views of the city and Bay. The location is an easy walk to many scenic parks and the Randall Museum, and extremely convenient for most anything city-related. This home has not been on the market since 1998, when is sold for $411,000. Originally, a contractor built the home for himself and his family. Next, a single person lived in the home for thirty years, after which it sold to the current sellers. Today, that price tag has more than tripled, landing at $1.850 million. This price calculates to over $1,000 a square foot, which is more than the current 30-day median price-per-square of $855. But then, not every home in this neighborhood has a master suite opening on to a private garden. What do you say, readers? 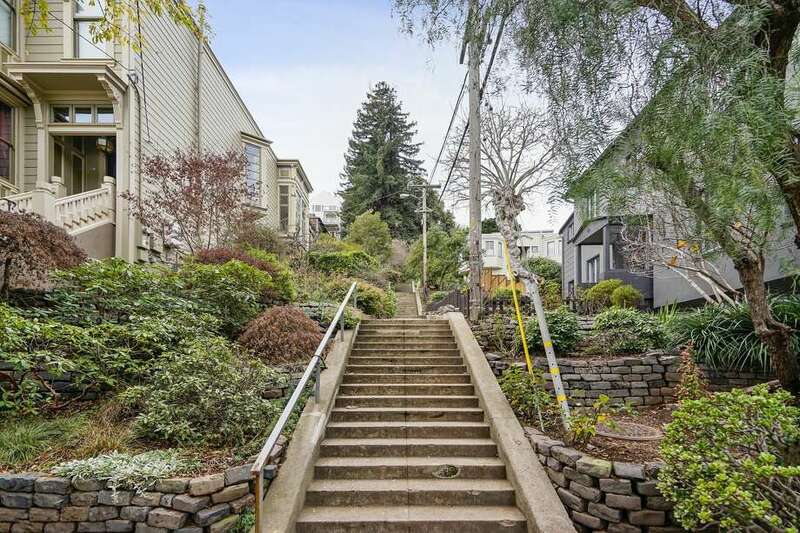 Will this Corona Heights gem fetch its asking?